You'll love this carrot salad with lemon that gives it a fresh, light taste – it's so simple but surprisingly delicious. When my friend, Sonia, brought us some to try, I wasn't expecting to love it so much. It looks pretty blah, but the THREE whole ingredients in this go together perfectly! That's it! Let me know if you love it as much as we do. Try fermented carrots, we love those too, and they're even better for you! I make the same thing, but add some golden raisins to it when I have them, and let it sit in the fridge overnight so the raisins absorb a little of the moisture and soften. we make it here with orange juice. Can’t wait to try this – I love simple! Sounds like a salad that will make my taste buds leap for joy! Thank you Sonia and Kelly. It’s me again to let you know that I love this recipe as much as you do! Just made it and I just hope there is still some left at meal time tonight. I can see why Carrie calls it a national treasure of the French. When I was in France as a teen we added the really grainy mustard but no sugar. Very good! I make up a big batch of this once a week and eat a little every day. 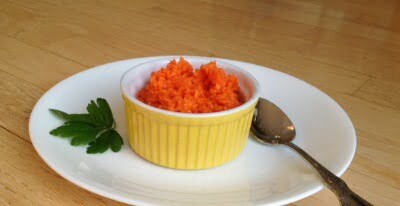 The French call it carottes rapees and it’s a national treasure! And Ray Peat, PhD says the salad will help detox excess estrogen and it’s great for the bowels too. I make mine with lemon juice, orange juice, salt and coconut oil. Sometimes I use apple cider vinegar instead of the juices. So yummy. I never use sugar. 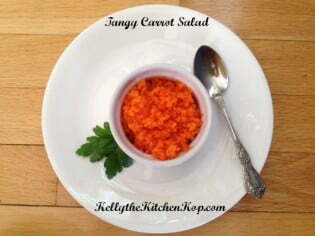 If you peel the carrots the salad tastes sweeter. Oooh, I like the sound of your versions, Carrie!